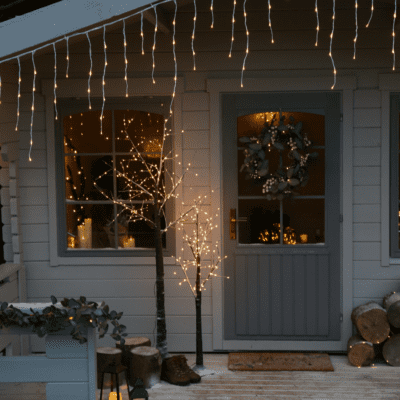 If you are either an outdoor tree lighting novice, or experienced pro who’s been doing this for years, hopefully this guide will be able to assist you and give you a fresh look on how outdoor tree lighting can be installed. So far in the office we have come up with four ways, which are mainly the options we will give to customers when we receive calls every year asking the best way to install. This will be extremely similar as to how people will normally erect Christmas Lights on a tree indoors, by simply wrapping lights around it from the base upwards. This will be done on a traditional style fir tree, albeit on a much larger scale than the artificial one that you may have indoors! We would recommend connectable lights for this, so that you can tailor the length ideally to your display. All of these come with a male and female connector, so that you can connect the lights easily as you run them around the tree. For anyone planning to decorate a hard wood tree, then wrapping the lights tightly around the branches will create a superb look when it is completed. 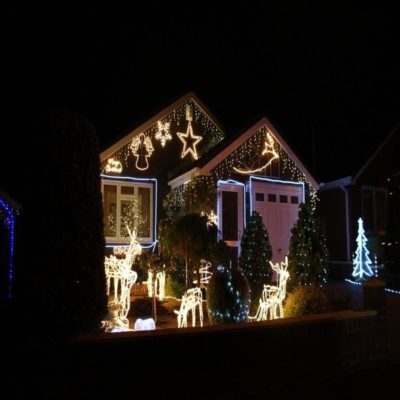 The picture below is a prime example of how this can be achieved, by simply connecting lights in sequence and running them up different branches. 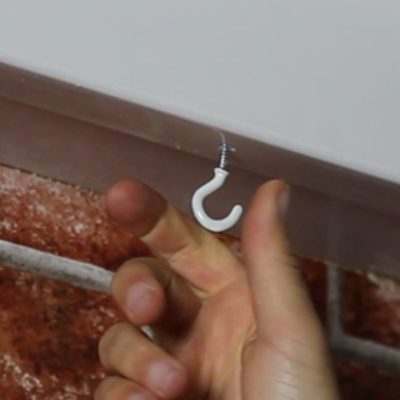 Many people also choose to use a ring connector when decorating in this style, and we will explain how that works in the next section. The ring connector is a handy accessory that can be used to add flexibility to outdoor tree displays especially. For a hard wood tree (such as the pictures above) a ring connector has been placed in the middle of the tree, and lights run out in different directions from this. Another option is to use a ring connector at the top of a fir tree, and run lights down in almost a curtain style from the ring at the top. 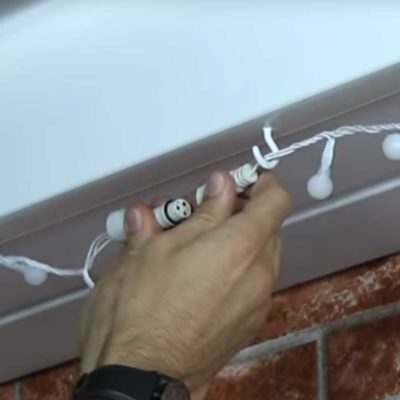 Either way, the ring connector will certainly reduce time and effort whilst installing your lights, and allow you greater flexibility when it comes to running lights in various directions. The last recognised way to install lights on a tree would be to use net lights, and to wrap them around a tree. This would have to be a thick fir tree, as it wouldn’t work as well on a hard wood tree. Most of our nets range from a 2 x 2m size to a 3 x 3m at the largest, so you will have to measure the dimensions of your tree exactly to work what you will need to cover the tree evenly. Installation will be fairly simple with this, and just a large ladder may be needed to secure the net in at the top! However once finished, you will have a simple yet elegant display that requires minimal fuss to erect. When using lights outdoors, spraying a coat of multi-purpose lubricant, like our Q20, over your lights will help to prolong their lifespan significantly. Q20 helps to stop rust and prevent water ingress, whilst prolonging performance, ensuring you get the most out of your display, year after year.